Above: The 1952 hand-drawn logo of the Die? No, sir! Club. They’re nearly 600 members strong. They travel the world, provide scholarships for UT students, are regulars at local cultural events, and are experts on the ever-expanding Austin culinary scene. They work out at RecSports, play bridge at the alumni center, and volunteer on campus to help with everything from spring commencement to UT Remembers. For the past 35 years, a busy Retired Faculty-Staff Association, or “RSFA,” has been keeping its members connected to each other and to the University. Above right: RFSA members gather for banquet each semester. The idea of an organization for UT retirees first originated with John Calhoun (photo at left). 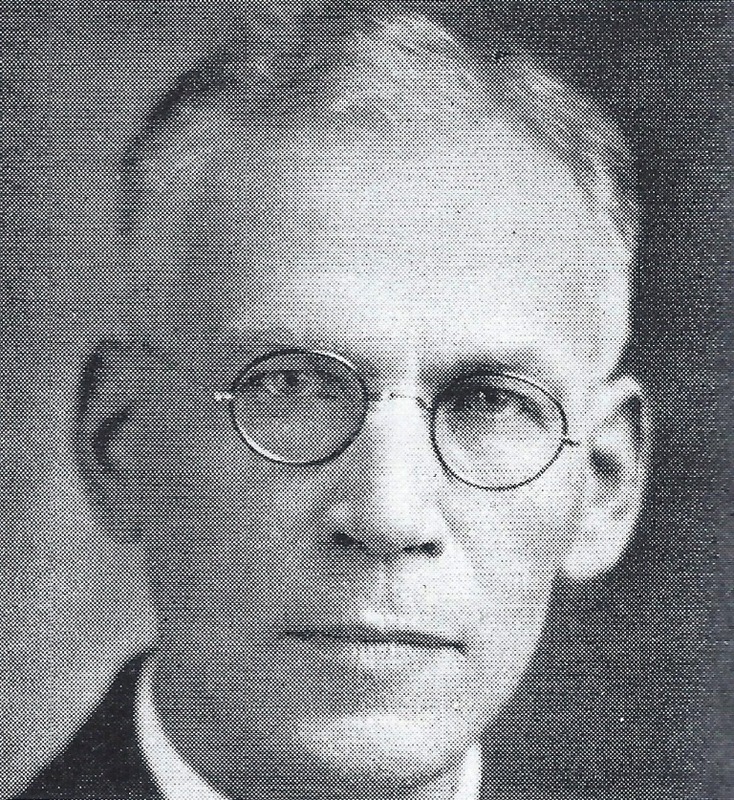 A 1905 graduate, Calhoun joined the mathematics faculty in 1909, later served as the University’s comptroller, and was appointed president ad interim from 1937 – 1939. Calhoun was perhaps best-known for his passion for live oak trees, and was primarily responsible for their prominence on the Forty Acres. Calhoun started with four live oaks – transplanted from nearby Pease Park – that still grow on the south side of Sutton Hall. 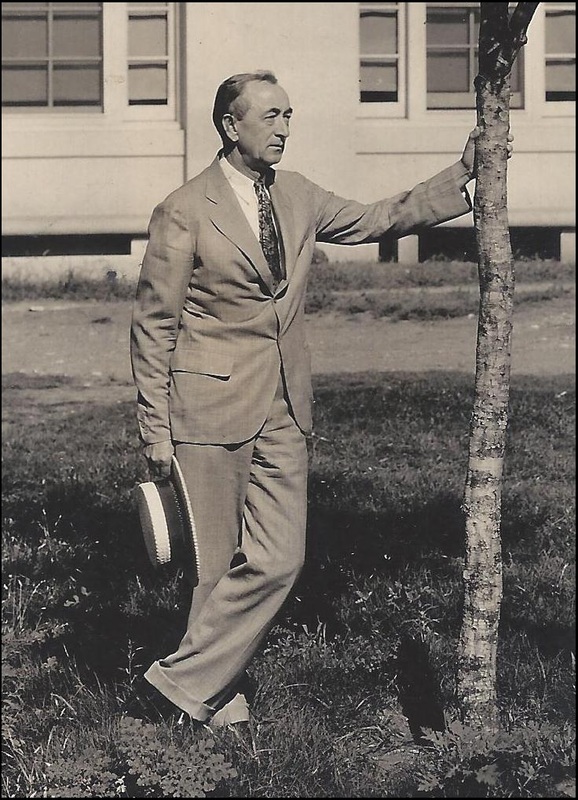 The oaks that shade the walks near and along Guadalupe Street were planted in 1928, and in the 1930s, Calhoun successfully argued for more live oaks on the West Mall, South Mall, and around the Main Building. He later drew a map of every tree on campus with detailed descriptions of those with interesting histories. It’s still consulted by the University’s Landscape Services. Calhoun drew up a constitution for the club.There were no dues and only one officer, the secretary, who acted as “president, secretary, corresponding secretary, recording secretary, and treasurer.” It was the secretary who called meetings and kept a roll of the members. As for being treasurer of a group without dues, Calhoun specifically wrote that “he shall have no duties, no emoluments, and no responsibilities.” Since Calhoun was UT’s comptroller for 12 years, this part of the office was likely the most appealing and why he included it in the by-laws. Above: A few members of the Dinosaur Club pause for a group portrait. Chemical engineering professor Eugene Schoch, second from left, also founded the Longhorn Band. 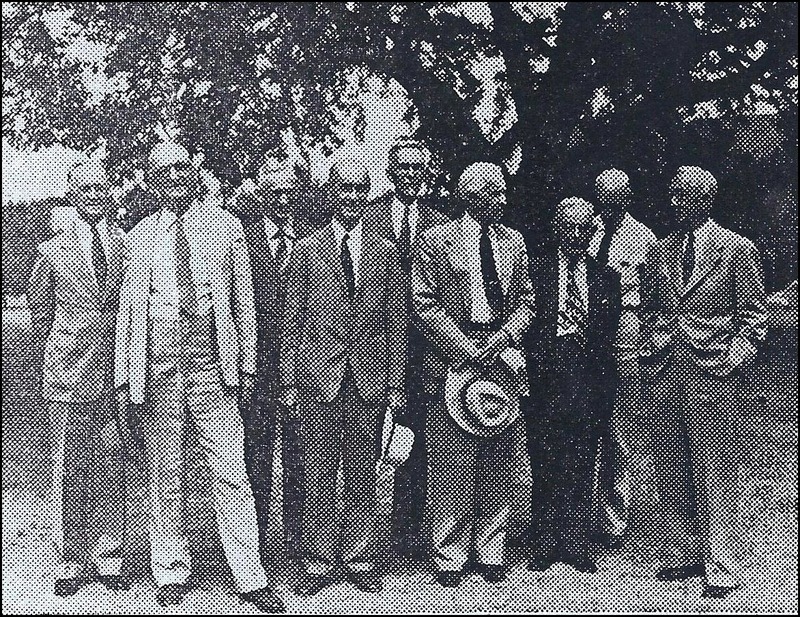 William Battle, fourth from left, taught Greek and classical studies, designed the UT seal, started the University Co-op, and was an important chair of the Faculty Building Committee. John Calhoun is on the right. The group was low-key and informal, and its members seemed to like it that way. 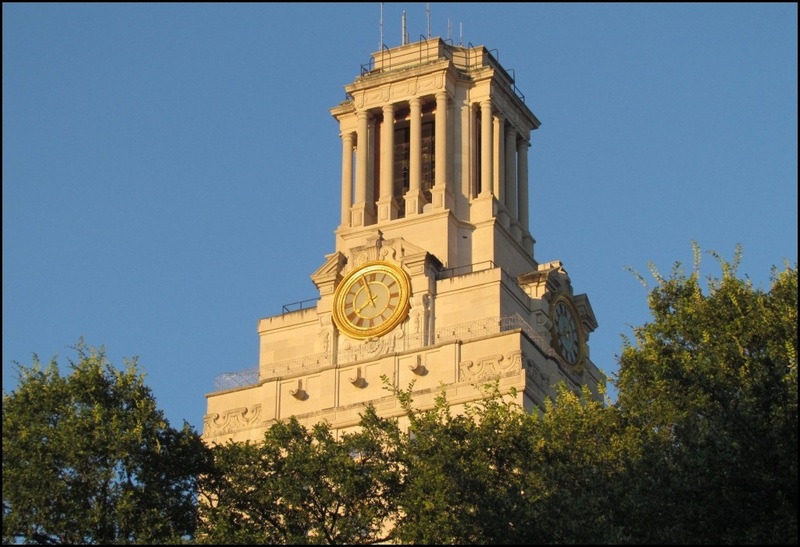 The club usually met for lunch at the Texas Union and discussed current affairs on the Forty Acres, though they were sometimes used as a resource by the University administration. 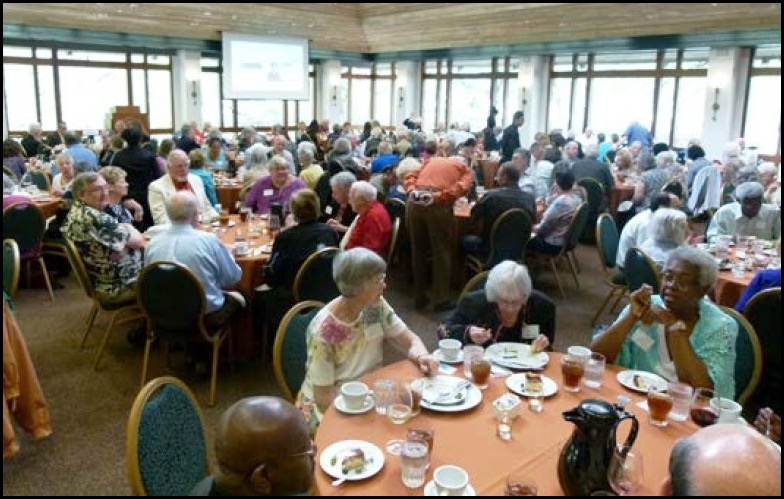 After all, the combined membership had given more than 1,000 years of service to UT, and they were happy to share their experience and advice. 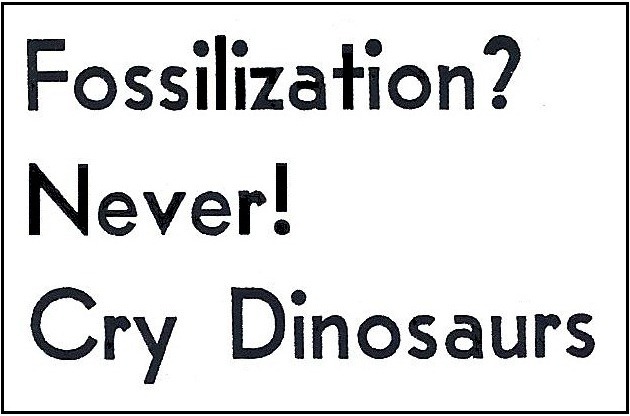 The Dinosaur Club continued for several decades. In 1982, under the guidance of UT President Peter Flawn, a more formal Retired Faculty-Staff Association was organized – and open to both women and men! The seals of a dozen universities are on the Main Building. Why? Formally dedicated more than 80 years ago – on February 27, 1937 – the University’s Main Building was designed to serve a variety of purposes. Functionally, it was meant to house the central library. Its grand reading halls and special collection rooms were assembled around a massive tower, which held the book stacks. 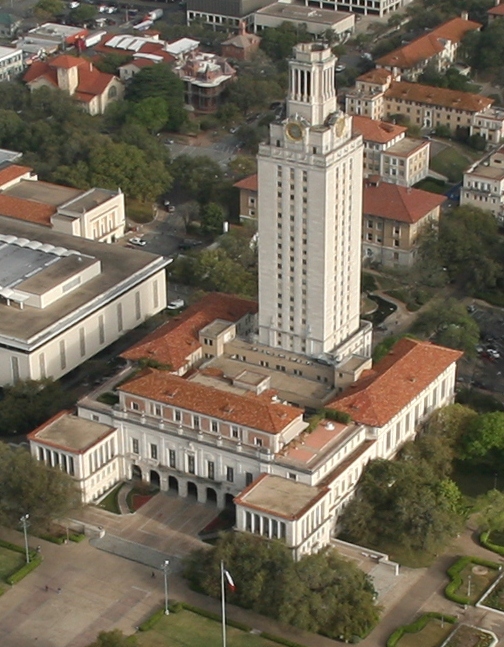 To accommodate future growth, the library was intentionally planned to be larger than needed, which prompted the Board of Regents to reserve a portion of the building for UT administration. Right: A line of dentils – those square “teeth” along the top of the image – along with an Ionic capital atop a pilaster, are among the Classical decorations on the Main Building’s south façade, all carved in place during construction. Click on an image for a larger view. Placed alongside the literary images were familiar Classical symbols. 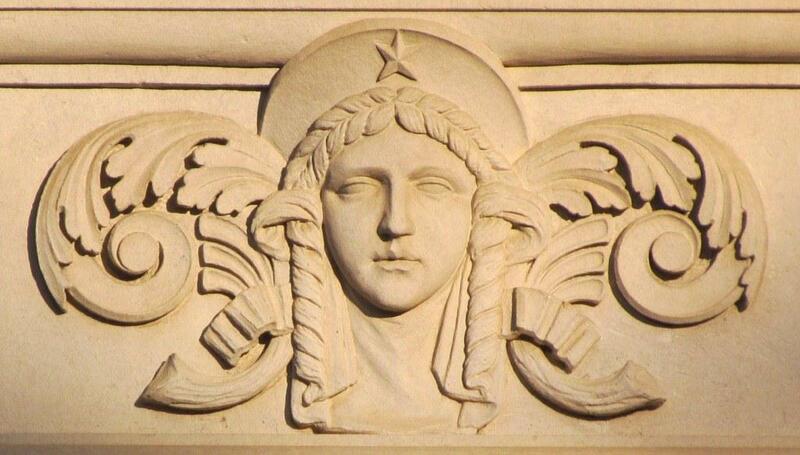 The lamp of learning, the face of Athena as the goddess of wisdom (photo above), and rows of scallop shells – associated with Venus as the goddess of truth and beauty – were all added to the south façade, carved in place by Italian stone masons. 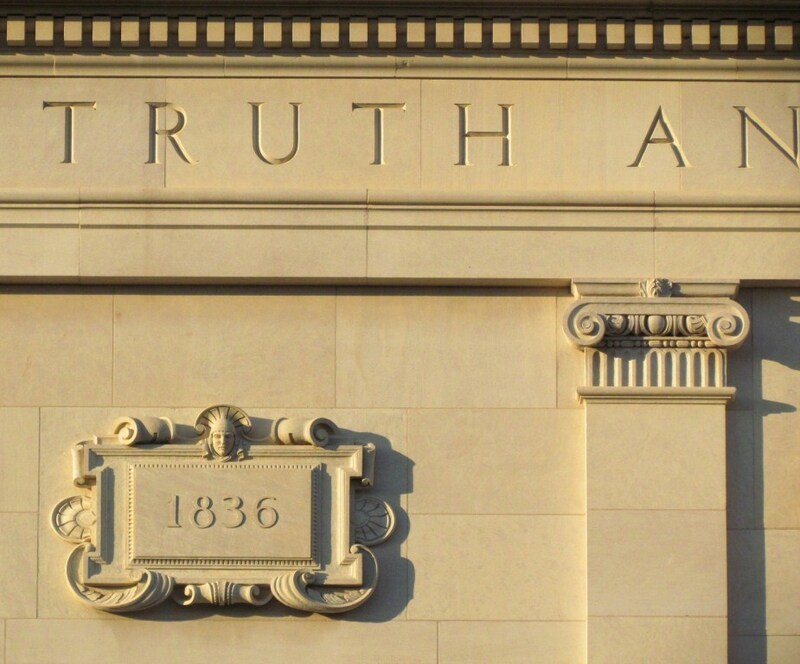 Learning, wisdom, truth, and beauty: values long associated with the purpose of higher education. 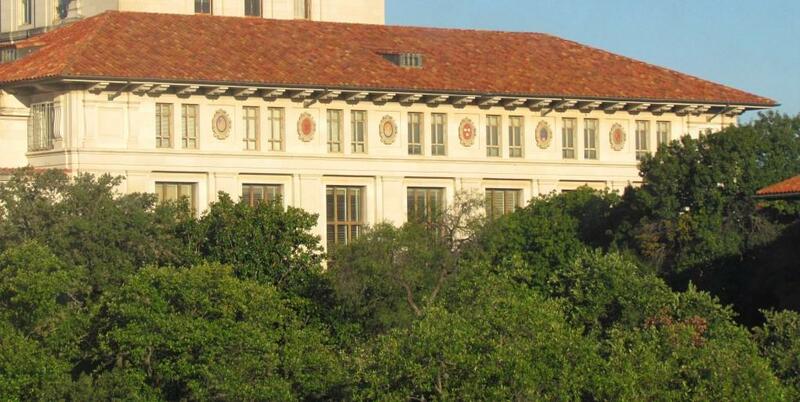 Above: Along the east side of the Main Building are six university seals. Above: The west side of the nearly-completed Main Building in 1936. 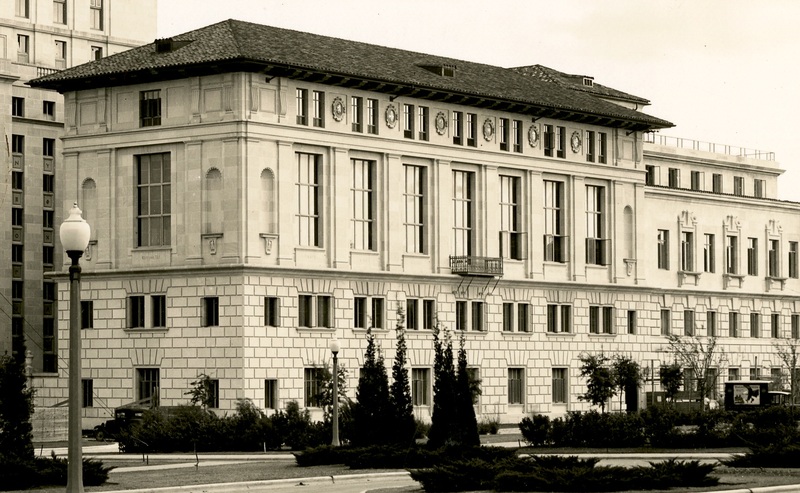 The seal project began in the spring of 1932, as the initial phase of the Main Building was under construction. Cret’s design allowed for something to be placed under the eaves, but left it to the University to determine the specifics. 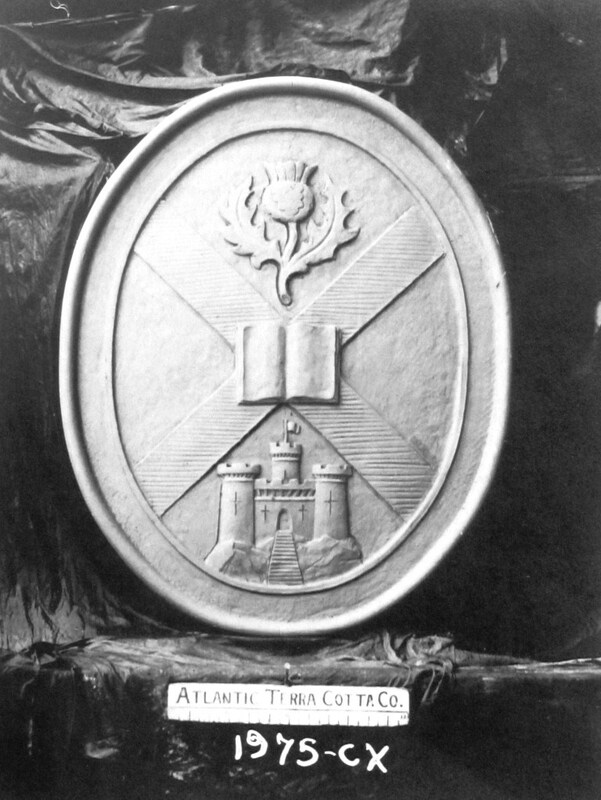 The idea to display university seals originated with the Faculty Building Committee and its chair, Dr. William Battle. Which universities would be included? Battle consulted with Professor Frederick Eby, then the campus authority on the history of higher education. Eby provided a list of fifteen candidates: Bologna, Paris, Salamanca, Prague, Vienna, Heidelberg, Oxford, Cambridge, Geneva, Leiden, Edinburgh, Harvard, Yale, Virginia, and Michigan. The roster was heavy on European schools and, in part, charted a genealogical line. Bologna in Italy, founded in 1088, is widely regarded as the first degree-granting modern university, followed closely by the University of Paris. 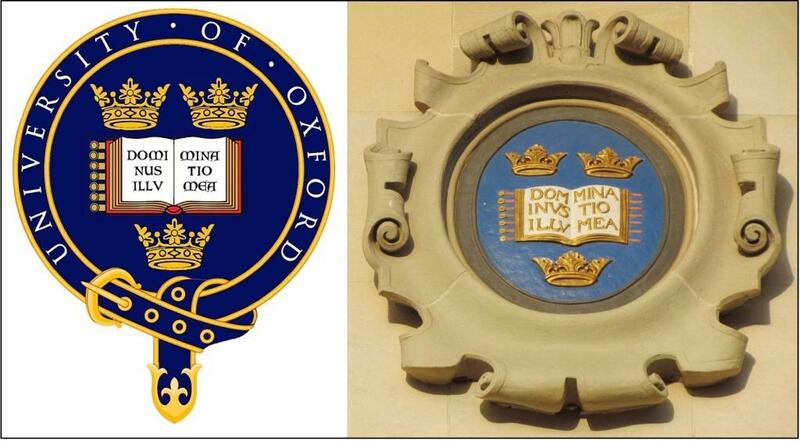 Oxford developed in the mid-12th century after King Henry II prevented English students from traveling to France. A dispute in 1209 between the town of Oxford and its university caused some of the local scholars to leave in protest and begin a new school in Cambridge. Four centuries later, among the Puritans who established the Massachusetts Bay Colony in North America, a group of Cambridge alumni created what would become Harvard. Located in the tiny hamlet of Newtowne, the group changed the name of the village to Cambridge in honor of their Alma Mater. The committee readily agreed. Mexico’s university predated Harvard, was the oldest in North America, and its connection to the history of Texas made it an obvious and appropriate choice. Mexico was substituted for Geneva. The Board of Regents gave its approval at their meeting on June 17, 1932, but allowed the committee to make minor changes if needed. In early July, John Calhoun, the University Comptroller and a member of the committee, suggested that a female college be added to recognize the inclusion of women in higher education. As a final change, Vassar College replaced the University of Prague. 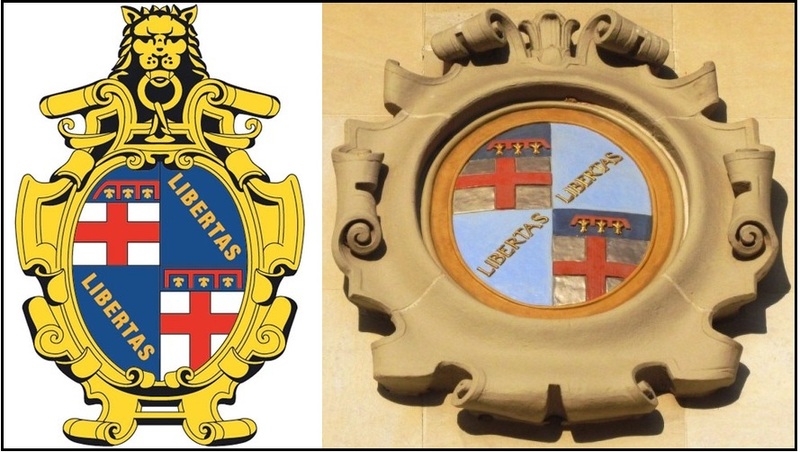 Above: From left, the seals of Salamanca, Oxford, Paris, and Bologna on the west side. While Battle required a black and white image to start, he also needed the correct colors. “The only place on which our seal appears in color,” said Frank Robbins, the assistant to the president of the University of Michigan, “is the flag which is annually carried at the head of the Commencement procession.” Robbins sent a copy of the 1931 graduation program, with an image of the UM seal printed on the front, and in pencil drew arrows to the various parts and listed the colors he saw on the flag. 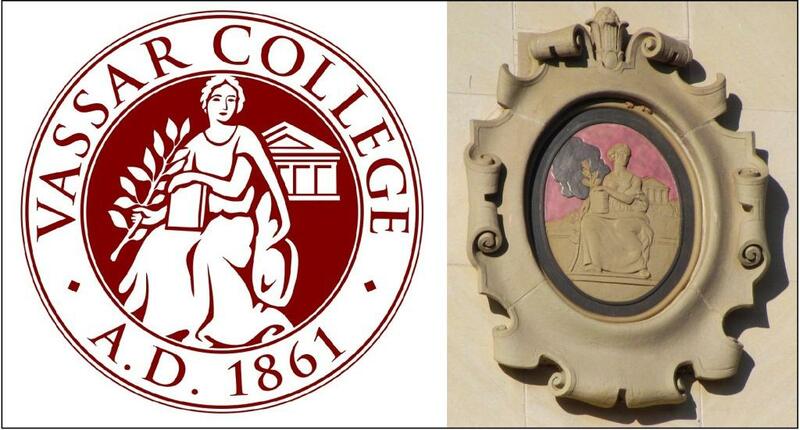 Vassar College proved to be the most challenging, as it didn’t yet have a printed version of its seal to send. Instead, Battle received two imprints of the seal embossed on a single sheet of white stationery. “This is our only emblazoning and it is not used with colors,” explained a brief note from the president’s office. “Unofficially, the colors of the college are rose and gray.” A pair of short clippings of rose and gray ribbon was attached with a paper clip. The highly regarded Atlantic Terra Cotta Company in Perth Amboy, New Jersey was chosen. Headquartered just southwest of New York City, it was only 75 miles from Cret’s firm in Philadelphia, and Battle wanted Cret to oversee the design. The cost to produce the twelve cartouches was just under $1,400. 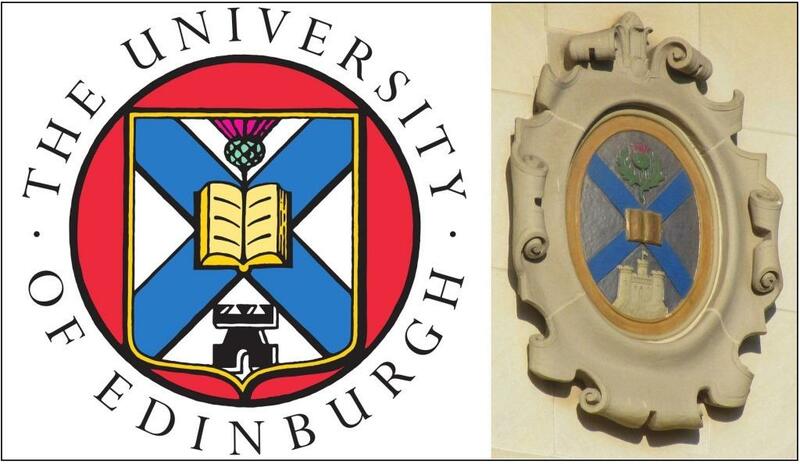 Above right: A terra cotta rendering of the University of Edinburgh seal. Through the fall of 1932, sketches of the cartouches were prepared in Philadelphia, and then sent to Perth Amboy to be fashioned in terra cotta. They were installed in early March, 1933. Above: The process. 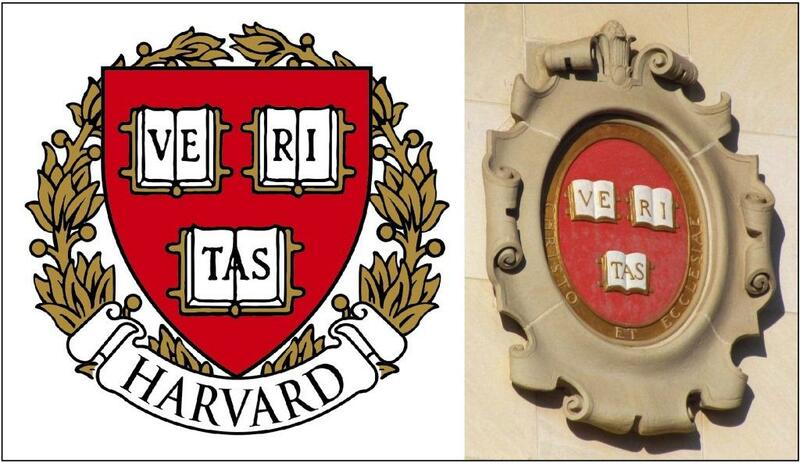 From a drawing of the University of Virginia seal in Paul Cret’s office, to a rendering by the Atlantic Terra Cotta Company, to finished cartouche. “The university shields are now in place and as a whole have excited general admiration,” Battle wrote to Cret. “They give very attractive spots of color, and the designs in most cases can be made out well enough to understand them.” Unfortunately, the Salamanca, Virginia, and Vassar cartouches, “being all in one color, and that a dull one, can hardly be made out at all from the ground.” While not entirely colorless, most of the renderings for these three were a natural light grey, which made it difficult to see details. An oil-based paint was applied to brighten the hues and provide additional contrast. 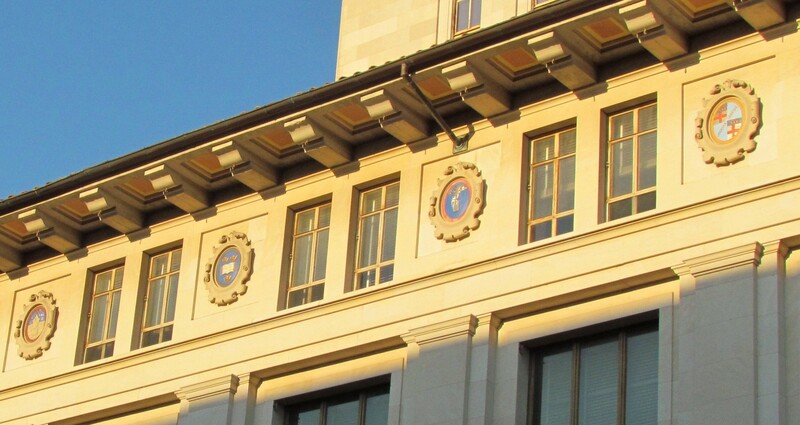 On the Main Building, the university seals are arranged in order of the years they were founded. 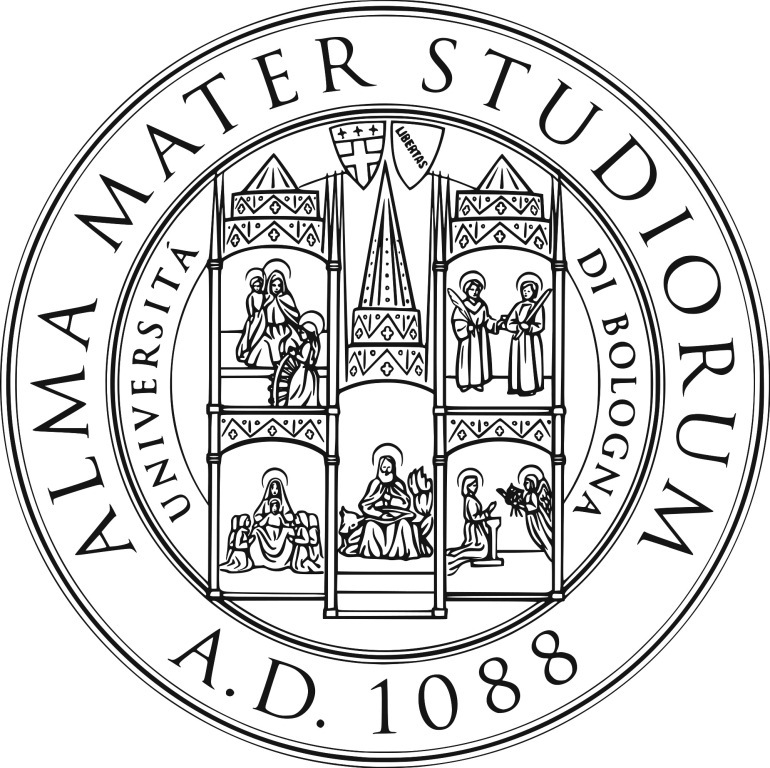 Bologna (1088): The original seal of the University of Bologna (left) was pressed into hot wax to authenticate official documents, and its design was purposely intricate to discourage forgery. 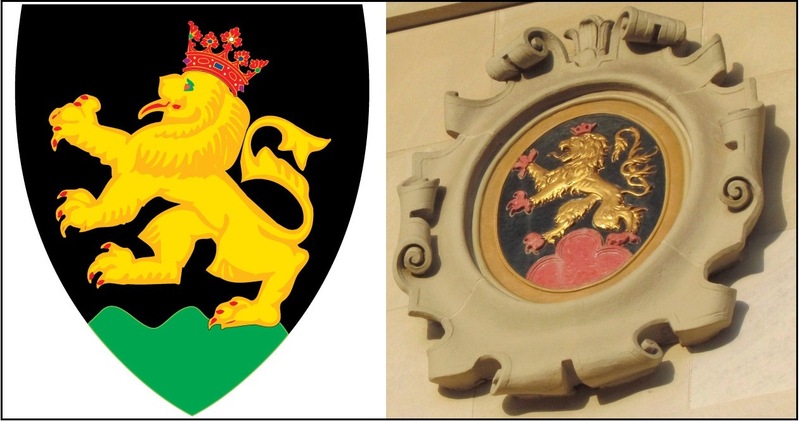 As it was too complicated to be easily understood as a cartouche, Cret and Battle opted to use the city of Bologna’s coat of arms instead. Paris (1200): Along with Bologna, Paris is one of Europe’s oldest universities. Here, the design was simplified. The flour-de-lis designs were eliminated to feature the “hand of God” delivering knowledge and wisdom from the heavens. 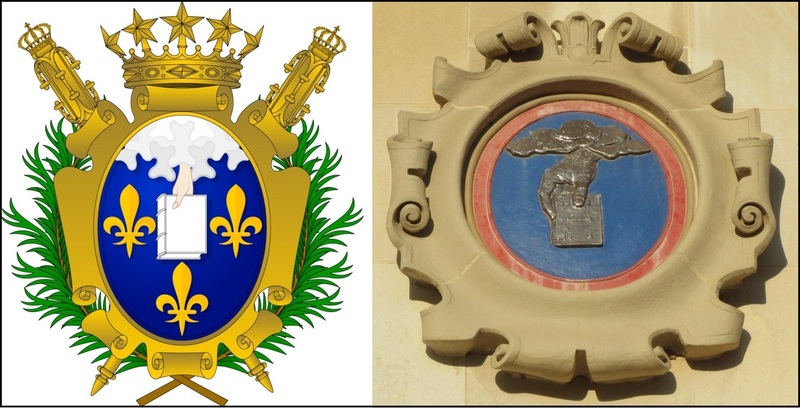 Though the present University’s seal is blue and gold, Cret, a native Frenchman, used blue and red, the national colors of France. Salamanca (1230): In medieval Europe, the University of Salamanca, Spain was best known as a law school. The cartouche on the Main Building was the only attempt to stay true to the intricate design of the original university seal. Officially black and white, university colors were selectively applied to highlight the many details. 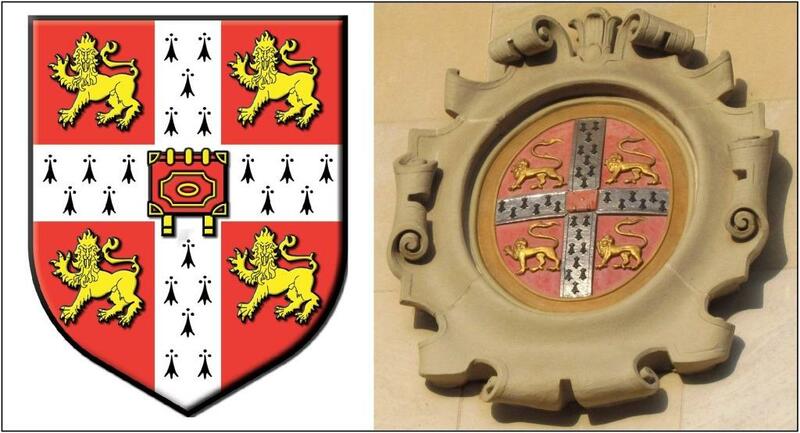 Cambridge (1281): The Cambridge University coat of arms was granted in 1573 and consists of a red background and a cross of ermine fur between four gold lions. A book, placed horizontally with the spine at the top, is in the center. Heidelberg (1385): As with the University of Bologna, Heidelberg’s cartouche is a representation of the city’s coat of arms. 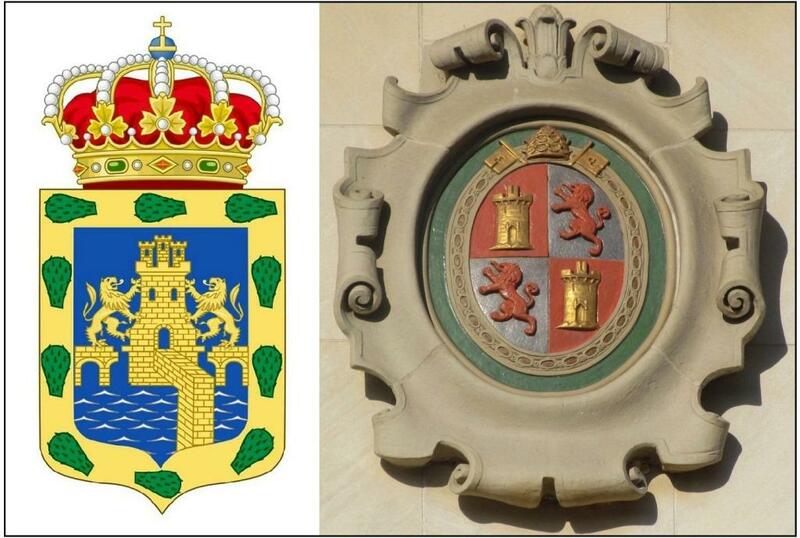 Mexico (1553): The oldest in North America, the University of Mexico’s seal features the castle and lion, symbolic of the Spanish crown when Mexico was part of New Spain. It’s also seen on the Salamanca cartouche. Edinburgh (1583): The coat of arms for the University of Edinburgh features the blue, St. Andrew’s cross of Scotland with an open book of learning at the center, an image of Edinburgh Castle at the bottom, the thistle – the national flower of Scotland – at the top. 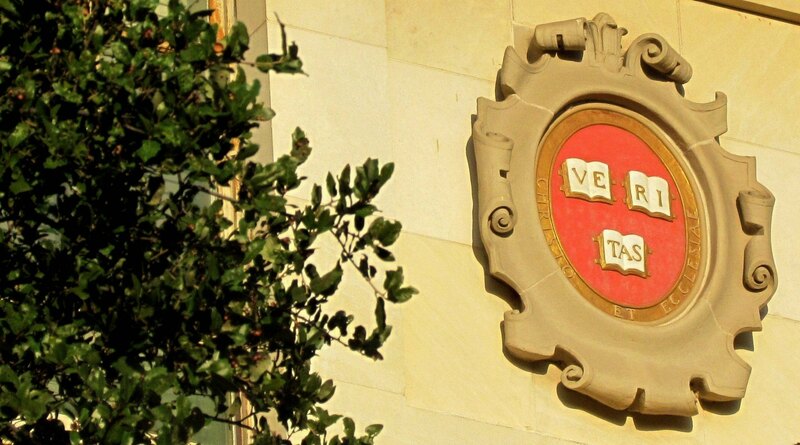 Harvard (1636): The oldest university in the United States, Harvard’s motto – Veritas, or “Truth” – dates to 1643. At a New England regatta in 1858, Harvard crew members Benjamin Crownshield and Charles Elliot hurriedly supplied crimson bandanas to their teammates so that spectators could easily distinguish them in a race. Elliot was named Harvard’s 21st president in 1869, and served in that capacity for four distinguished decades. In 1910, the year after he retired, crimson was officially named the University’s color and added to the seal. 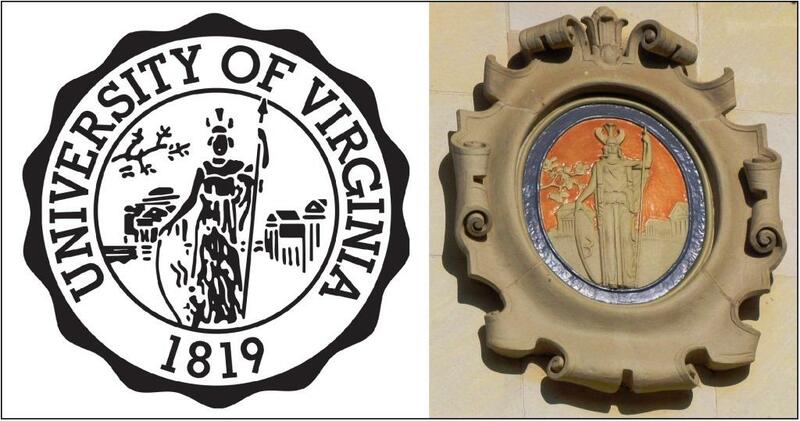 Virginia (1819): Founded by Thomas Jefferson, the University of Virginia’s seal features an image of Athena, the goddess of wisdom, standing in front of the original mall and buildings of the campus, which Jefferson termed an “academical village.” As the seal was colorless, Cret’s office had to artistically add UVA’s orange and blue to the design. 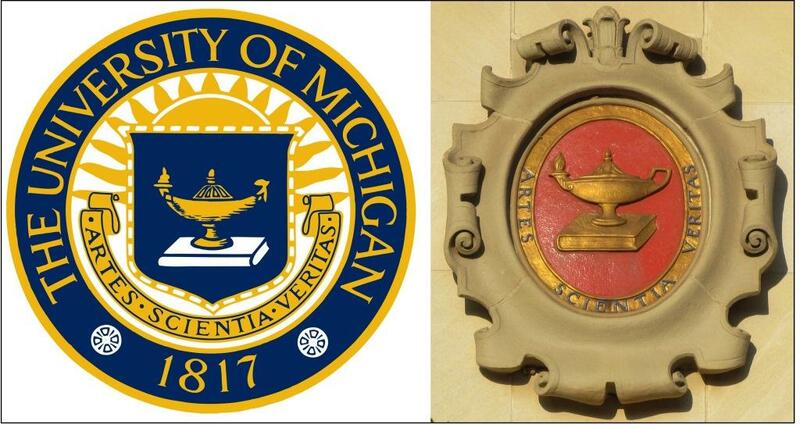 Michigan (1817): The University was founded in Detroit two decades before Michigan became a state, and its seal has been through several revisions. Currently all blue and maize, the description Battle received in 1932 included a red shield in the center. The design was simplified for artistic reasons – the sun and rays were eliminated – and the red shield became the predominant hue, though blue is still seen on the motto, Artes, Scientia, Veritas – Art, Science, Truth. Vassar (1861): Now co-educational, Vassar was founded as one of the first women’s colleges in the United States. The seal wasn’t approved by its Board of trustees until 1931, only a year before Battle requested a copy for use on the Main Building. The design features an image of Athena as the “patron of learning,” holding an olive branch as a symbol of civilization, and with a view of the Ancient Greek Parthenon in the distance. As with the Virginia seal, there were no colors yet assigned to it, though the College’s colors were unofficially rose and grey. Cret’s office had to make artistic decisions, and oil-based paint was used to color the cartouche.